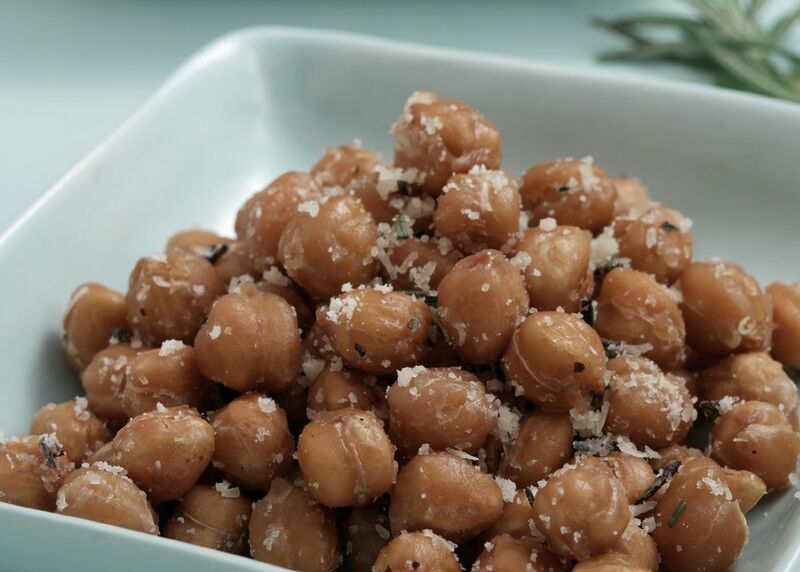 Oven roasted chickpeas (garbanzo beans) with Parmesan cheese are a healthy snack perfect for vegetarian kids and also for adults who want a high-protein and gluten-free vegetarian snack idea. This recipe for chickpea nuts is a quick and easy (and healthy!) homemade snack perfect for lunch boxes, picnics or after-school snacks for vegetarian kids. Make them vegan by omitting the cheese, if needed. Never made homemade oven-roasted chickpeas before? You're in for a real treat! When roasted in the oven, chickpeas (garbanzo beans) transform into the perfect combination of salty crunchy goodness, just as satisfying as potato chips or salted nuts, but without all the added fat. Plus, they're a pretty good bargain, which means that oven-roasted chickpeas are just about the most perfect snack ever. While fresh Parmesan cheese isn't necessarily the perfect budget food, canned chickpeas are usually just a dollar when on sale or a bit more, but if you cook your own from scratch, then this recipe will certainly fit just about any family's budget. Need some more snack ideas? Here's dozens of simple snack ideas for kids and grown-ups. Recipe and photo courtesy of Bush's Beans. Preheat the oven to 400 F and line a large rimmed baking sheet with aluminum foil. Lightly pat the chickpeas (garbanzo beans) dry with a paper towel (or you can also use a salad spinner for this if you have one), and place in a large bowl. Drizzle the chickpeas with olive oil and sprinkle with sea salt or kosher salt and fresh ground black pepper. Using a spatula, toss or stir very gently in order to coat the chickpeas with oil and salt as evenly as possible. Arrange the chickpeas in a single layer on the foil-lined baking sheet and bake in the pre-heated oven for 15 minutes. After 15 minutes, remove the pan from the oven, and shake it lightly to stir chickpeas, then bake for another 15 minutes. Remove the pan from the oven again and sprinkle the chickpeas evenly with rosemary, then bake for an additional 8 to 10 more minutes, until the chickpeas are crunchy. Finally, remove the chickpeas from the oven and while they're still hot, sprinkle the Parmesan cheese over the chickpeas evenly, and gently toss to combine and coat. Enjoy your homemade oven-roasted chickpea nuts! Some people do not consider Parmesan cheese to be vegetarian due to the way it is manufactured. For more information, please see: Is cheese vegetarian? These oven roasted chickpeas are also delicious without the cheese, if you'd like to make them vegan.